"These are yummy. If you can manage to get them to cook just the right way, they aren't crunchy, but soft and the tiniest bit chewy, and melt in your mouth!" Preheat oven to 350 degrees F (175 degrees C). Grease baking sheets. Sift together the flour, baking powder, baking soda, and salt. Set aside. In a large bowl, cream together the butter, white sugar, and brown sugar until light and fluffy. Beat in the eggs one at a time, then stir in the vanilla. Gradually stir in the sifted ingredients. Stir in the rolled oats and chocolate chips. Drop by rounded teaspoonfuls onto the prepared baking sheets. Bake for 8 to 10 minutes in the preheated oven. 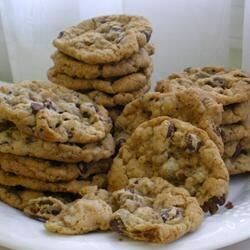 Allow cookies to cool on baking sheets for 5 minutes before removing. This recipe was horrible the cookies turned out hard as a rock and tasteless. I followed the direction exactly. The kids said "mom your a good baker but those are yucky". Fantastic! I used only 1.5 sticks of butter and 3/4 c sugar and it worked out great! Chewy in the middle and crisp on the edges! Yummy!